It would be ironic if on this feast of the patron saint of writers that I did not write a few words at the very least on Francis de Sales, who expressed, at the height of the divisions and schisms caused by the Protestant ‘reformation’, the right way to do ecumenism: With a gentle and charitable soul, firmly grounded in the truth and holiness, Francis’ sermons were mesmerizing, and, as bishop of Geneva, he won many, many souls back from the erroneous paths of dour and doom-ish Calvinism. His joyful demeanour, and his obvious love of the faith, drew many; as he once wrote, you attract far more flies with honey than vinegar. After a full and fruitful life, as confessor and advisor to kings and potentates, to the rich and poor, a founder of religious orders, and a father and patron to an untold number, Bishop de Sales went to his eternal reward in 1622, three days after Christmas, at the rather tender age of 55 (keeping in mind that the future bishop Karol Wojtyla would not even be chosen as Pope until his 58th year). He was declared one of only 36 doctors of the Church, by Pius IX in 1877. Bishop Francis was rare in those days for advocating holiness in laypeople, as well as priests and religious. Devotion is nothing else than the striving for perfection of the will, in union with the will of God, in doing one’s duty as well as one can, on whatever path one is called. Excellence, virtue and magnanimity should be the hallmark of every Catholic. 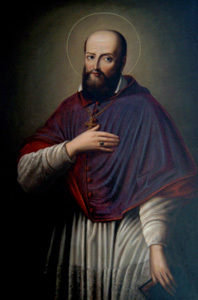 Saint Francis de Sales, ora pro nobis!